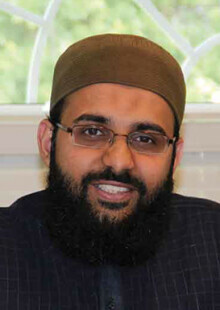 Imam Atif Chaudhry grew up in New Jersey, where he completed his memorization of the Holy Qur’an at an early age. As a young adult Atif traveled to Pakistan and studied in the Islamic Seminary of Darul Uloom Muhammadiya Ghausia for two years, and then studied Shari’ah sciences as well as law in the International Islamic University of Islamabad for five years. Since March 2014, Imam Atif has been the Imam of the Islamic Society of Greater Charlotte, where he teaches several classes, focuses on community-building, and gives lectures on Islamic topics.